Astrologer’s Proof raises intriguing questions about the role of the universe in the everyday lives of earthly beings. 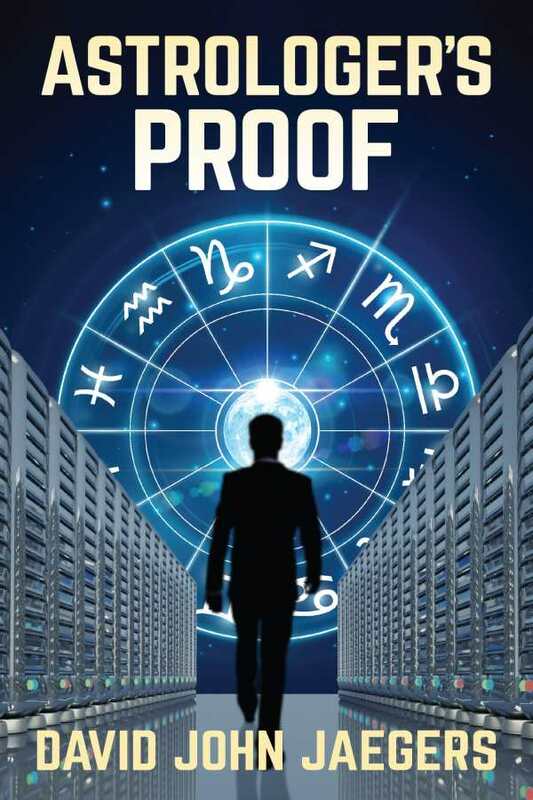 An intriguing theory that people’s lives can be guided by scientifically proven astrology is at the heart of David John Jaegers’s Astrologer’s Proof, a contemporary novel with its eye on the sky. A host of characters are led by Rufus, a sheep farmer and true believer in the power of the planets. Under the guise of a philanthropic group, they will break the law to source the data they need. Is their goal worth their ethics-bending behavior, even if it ultimately invades Americans’ privacy? That quandary is at the heart of the book. Rufus and his group—which includes his nephew, Robert, and several hackers—are on a mission to collect as much data from one hundred million Americans as possible. They believe their goal of proving planetary influences on human behavior is worthy, even godly, and so rationalize their behavior as ultimately helpful. The story brings the worrisome realities of the twenty-first century into in full view: data collection agencies that sell information in the name of marketing, super quantum computers that crunch massive amounts of data in order to find common links, and debates over privacy and access. Such heady and complex topics are concisely and informatively handled. Several characters with various kinds of involvement in Rufus’s plot are incorporated. They include both the elusive, big-money founders of a philanthropy group and the computer operatives who set up remote data downloads from state agencies and the IRS. As such, a lot of names are bandied around, leading to occasional confusion as to who is vital to the plot and who isn’t. Scant personal details result in shallow characters. Some seem present only for background effect. Tangential and play-by-play descriptions also divert attention from the story line without enhancing the plot. Writing is candid and well paced, with clear explanations of topics that might otherwise seem opaque. Sentences that reference astrology are less clear for those not in the know on the topic. In raising contemporary issues and ethical quandaries, though, the story—even when it reaches for the stars—has grounded roots. Astrologer’s Proof raises intriguing questions about the role of the universe in the everyday lives of earthly beings. The novel stands to be inspiring to anyone who ponders how the information and technology age can contribute to human understanding and the search for meaning.